The specification of the RoSE scenarios is based on three key dimensions: (1) underlying assumptions on future socio-economic development determined by population and economic growth; (2) reference assumptions on long-term fossil fuel availability, with a focus on variations of coal, oil, and gas; and (3) stringency and timing of climate protection targets and framework of international climate policy. The variation of the first two dimensions provided 12 baseline projections that were adopted by the global models in order to explore the sensitivity of systems transformations to the underlying socio-economic and fossil resource assumptions. These baseline assumptions were then combined with climate target scenarios in order to provide insights into the costs and feasibility of mitigation options under alternative futures. The full RoSE scenario matrix can be seen below. Each column corresponds to a combination of socio-economic and fossil resource drivers, and each row is linked to a climate policy regime. Population and GDP: Models were harmonized to the medium population projection from the 2008 Revision of the UN World Population Prospects (peaking at 9.4 billion in 2070). 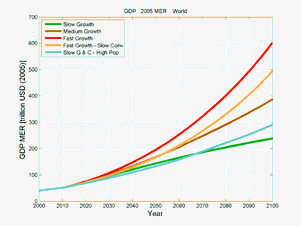 The GDP scenarios build on the population projections and encompass assumptions regarding both the speed of economic growth (slow – medium – fast) and the convergence characteristics between 26 aggregate world regions (slow and fast convergence). 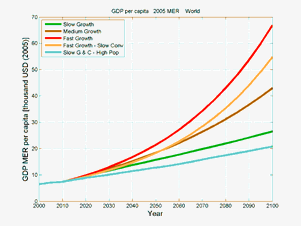 The study also included a slow growth – slow convergence GDP scenario that was based on the high population projection of the UN 2008 Revisions (going up to 14 billion in 2100). Fossil fuel availability: Fossil fuel availability was characterized in terms of supply curves describing extraction costs as a function of cumulative extraction. First, data on the estimated total size of the fossil resource base have been assembled. Oil, gas and coal have been treated separately, with an additional division into conventional and non-conventional resources. In a second stage, historical data for recovery rates have been examined and then extrapolated, under varying assumptions about technological progress, towards future resources. Finally, the costs of extraction for different grades of each of the resources have been estimated. The output of this process consists of three extraction cost curves, assuming ‘low’, ‘medium’, and ‘high’ resource availability, for each of the three fossil resources. 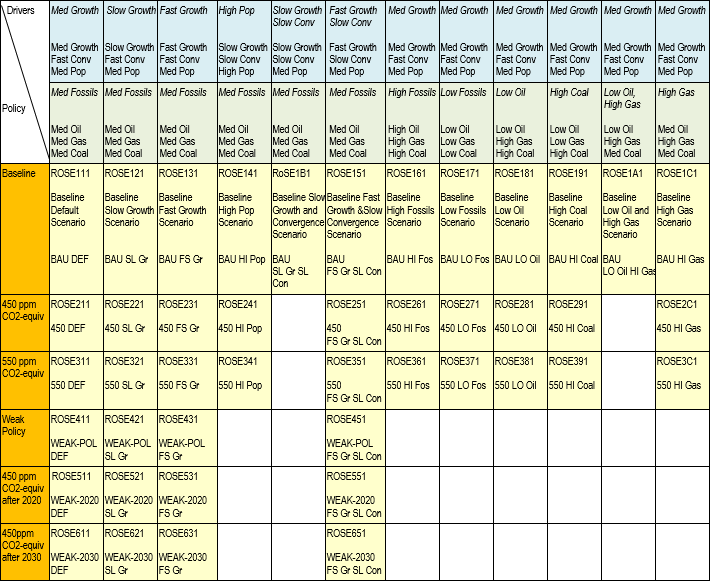 The assumptions on the availability of oil, gas, and coal, have then been combined into concrete scenarios (see scenario matrix below). 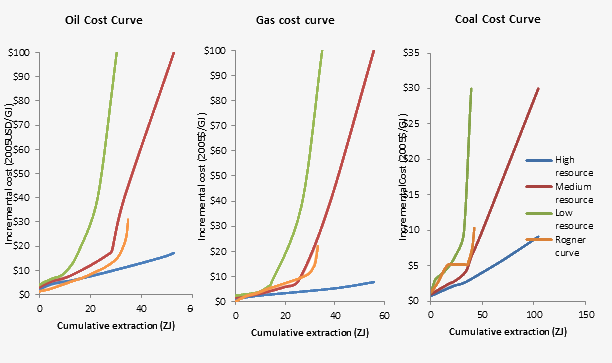 The figures below depict the low, medium, and high extraction cost curves for oil, gas, and coal (from left to right) as established in the study. The extraction cost curves estimated by Rogner (1997) are shown for comparison. 450ppm in 2030: this is identical to the previous scenario, only that the 450ppm stabilization target is adopted at 2030.